In this blog, couple of the methods have used to try and fix the problem. What worked for me may not work for you, so go ahead and try all the different possible solutions. 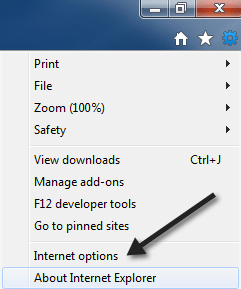 If you still can’t get the back button working on IE, post a comment here and I’ll try to help. The first thing to try is to disable all add-ons and see if that solves the back button problem. 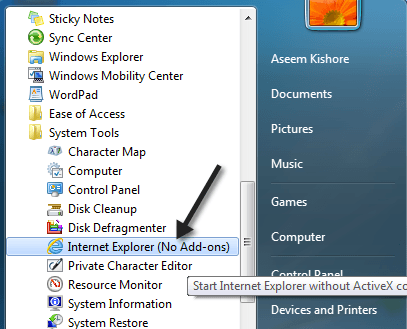 The easiest way to start Internet Explorer without add-ons is to click on Start, All Programs, Accessories, System Tools and then click on Internet Explorer (No Add-ons). If the problem disappears, you know one of the add-ons is causing the issue. Go ahead and disable add-ons one a time until you kind the culprit. If that didn’t solve your problem, keep on reading through the other solutions. 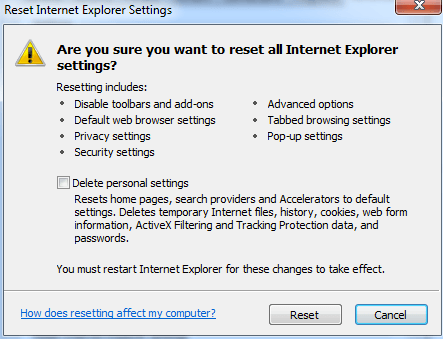 You can also try resetting Internet Explorer by clicking on the Tools button and then Internet options. Now click on the Advanced tab and then click on the Reset button at the very bottom. Now you will get a pop up dialog that goes through everything the reset process will do like disabling toolbars/add-ons, resetting security, privacy, and browsing settings. You can also choose to delete personal settings like the home page, search providers, accelerators, removing temporary Internet files, cookies, browsing history, saved form data, tracking data, and passwords. Apparently, this problem has been around for a while, so go ahead and install the latest Windows updates as there could be a fix for it in one of the updates released. If your computer is up-to-date and you’re still having the Back button problem, keep reading. Some people have noted that this back button problem happens with Google AdSense ads or other types of widgets running on a webpage. When you click back, it’s actually working, but it’s going through a bunch of ads instead of the last web page you visited. A couple of people suggested pressing the Alt key + back button or pressing the Refresh button and then pressing back. Give them a try and see if either solution works. Obviously, it’s not an ideal solution, but if you don’t have the problem all the time or have it on certain websites only, then you can use these tricks. 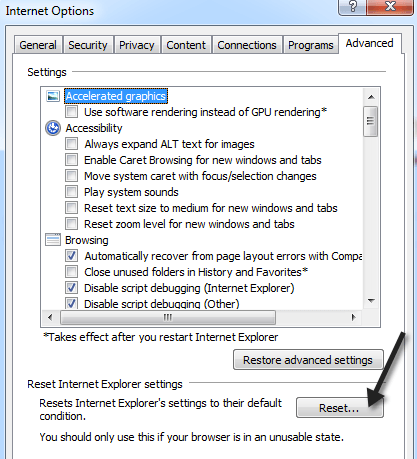 The last thing you can try is to uninstall IE completely and then reinstall it. You can do this by going to Control Panel, Programs and Features and clicking on Turn Windows features on or off. 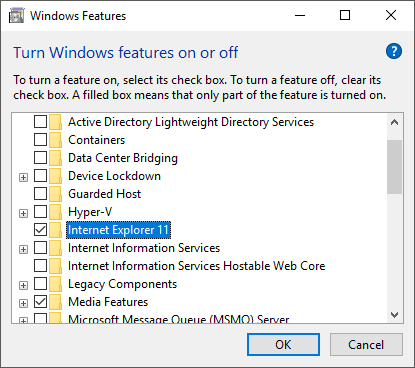 Go ahead and uncheck Internet Explorer 11 and then restart the computer. If you solved the problem using a different method not listed here, post a comment and let us know. Method 2 is what worked for me. Hopefully, something here fixes your problem. Enjoy!